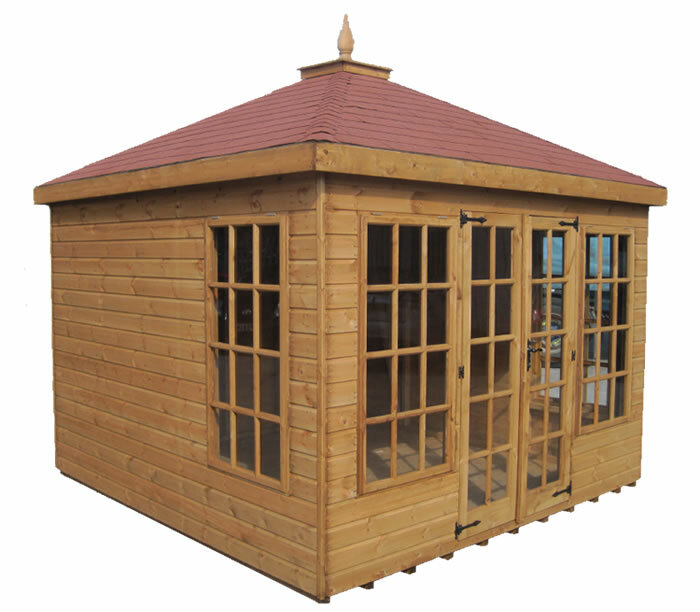 The Sandringham Summerhouse, available in 10'x10' (3.05x3.05m) and perfect for the larger garden. A grand summerhouse, incorporating the Georgian style, toughened glass throughout and a hipped roof with a choice of coloured roofing tiles. As standard the Sandringham includes double doors, two sets of 12 pane side windows and two sets of 12 pane front windows. The Georgian double doors include antique hinges, ornate handles and lever lock. Numerous options are available to customise the doors and windows of the Sandringham; choose between the standard Georgian style or alternatively leaded or plain folding. Upgrade options include 18mm premier cladding, 15mm log lap cladding as well as an 18mm heavy duty floor.